Montgomery County, Maryland garbage truck drivers have asked for help in their effort to join LIUNA and be treated fairly by their employer. Jacob Alvial, currently on strike in Montgomery County told a LIUNA organizer, "Our employers have said they don’t have to negotiate with us because they aren’t feeling any pressure from our strike." We need YOU, to show them that you care how they treat their workers and let them Feel the Power of LIUNA. Collecting trash is dangerous and demanding work, and Jacob and his co-workers want the resources they need to take care of ourselves and our families. Right now, they can’t afford to take the health insurance offered by the company, and Montgomery County investigators have found the company has regularly violated the County’s living wage law. So far, workers have gotten a lot of support and encouragement from the Montgomery County Council, Maryland State Delegates, and residents. 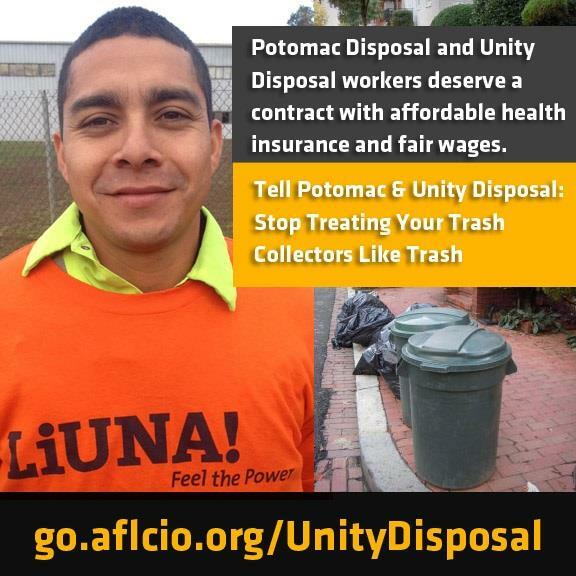 However, Potomac Disposal and Unity Disposal still won’t meet us halfway and sign contracts that include affordable health insurance and fair wages. Please call them and tell them that their employees deserve affordable health insurance and fair wages. Then, sign the petition to let us know you called. We can’t trust these companies to count your calls accurately. Signing on will help us make sure we can tell Montgomery County Executive Ike Leggett exactly how many of you support us.